By night Albin is 'Zaza' the star of the St Tropez drag club, La Cage aux Folles, run by his partner, Georges, whose son from a one-night fling, Jean-Michel, returns home to announce his forthcoming marriage to Anne, whose father, right-wing politician Dindon, advocates against non-heterosexual 'lifestyles' and for a return to so-called traditional values. More upsetting is that Jean-Michel requests his father and biological mother act as a couple and that Albin be absent for the meeting of the two families, despite Albin having raised him as his own alongside Georges. The repercussions of this announcement form the central crux of a musical which radiantly promotes positive ideas of family and love. Harvey Fierstein's book remains as relevant, as funny and as moving as ever and Jerry Herman's score remains one of his best, replete with numbers ranging from the most showy of show-stoppers to the most tender of ballads; the glorious songs include the call to seize the moment of "The Best Of Times", the romantic "Song On The Sand" and the soul-stirring "Look Over There". And of course La Cage contains one of the most anthemic numbers ever composed for the stage in "I Am What I Am". The direction is fluid, tight and focused, retaining an air of innovation, and the comedy and chaos is controlled whilst simultaneously appearing to be free of restraint. The choreography is also perfectly attuned to scenes both within the club and outside of it and show the Cagelles in their full force. The design is a glorious visual treat, from the glamorous costumes to the chic settings that smoothly transition from one scene to the next, and it is yet another stand-out aspect of this truly outstanding production. 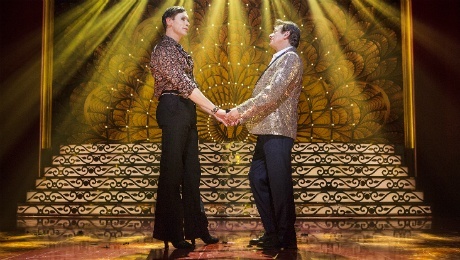 John Partridge is electrifying as Albin/Zaza, a role he inhabits completely, and he is outrageous, hilarious and emotionally heart-breaking in turns. His full, rich voice is put to great use throughout the show as is his enterprising physicality. Not to be outshone, Adrian Zmed is a suave, calm and collected Georges who eloquently keeps the madness about him in check. His relationship with Partidge's Albin is at once honest, believable, tender and affectionate and Zmed is a welcome addition to the British stage. Entertaining, thought-provoking and gloriously staged, La Cage Aux Folles is one of the most impressive productions to have toured the UK in recent years and remains one of the most relevant and timeless of musicals. Grab a ticket and enjoy! 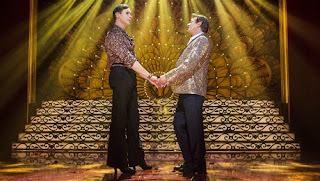 La Cage Aux Folles is at the King's Theatre Glasgow until Saturday 29th July. For tickets and information visit the King's Theatre website.